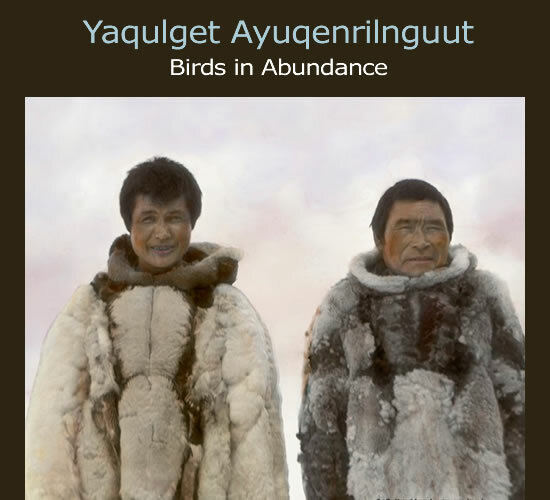 Ilurall'er (Kenneth Samson) wearing a swan skin parka and Kanglek (John Gunlik) of Kipnuk wearing a tamacenaq (parka made of a combination of different bird skins). Wagg'uq tua-i tamakunek tamaa-i kanassaagaucirluteng pitullrulliniluteng. [When birds arrived in spring] people began eating them to try and survive until other foods were available. The lowland delta of southwest Alaska supports one of the largest populations of water birds in the world. Countless ponds, lakes, and streams crisscross the marshy coastal wetlands. More than a million ducks and half a million geese breed there annually each spring and summer. Coastal elders recall flocks of geese passing overhead, blocking out the sun and making a thundering noise.